process actually happens inside the grape, without oxygen. In an aerobic situation, the grapes are crushed, allowing oxygen to interact with the yeasts, which then convert sugar to alcohol and CO2. That’s the basic fermentation. In an anaerobic situation, grapes are put in a tank and oxygen is replaced with carbon dioxide. This prompts a chemical reaction inside the grape, where sugars are converted into alcohol while the grape remains whole. What’s the difference? First, the wine spends virtually no time on its skins, so it does not absorb the tannins, color or other phenolics that skins provide during fermentation. The result are wines that are fruity in aroma and flavors, sometimes with a distinct banana aroma. They lack tannins, and deep color. 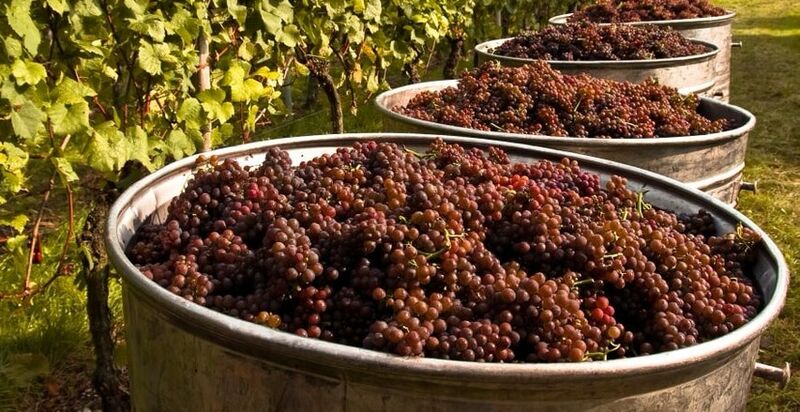 Carbonic Maceration is most commonly practiced in Beaujolais with the Gamay grape,which has thin skins and produces lots of fruity aromas and flavors. The resulting wines are bright and fruity, very low in tannins and ready to be drunk young! Though not used with all wines from Beaujolais, all Beaujolais Nouveau uses the process. Occasionally some wines will have partial carbonic maceration (like the higher end Beaujolais wines), which means that some of the grapes go through anerobic fermentation, while the rest go through aerobic fermentation. This can happen especially in whole cluster fermentation, where the grape clusters are not separated, but instead throw in to ferment together. The grapes on the bottom of the tank, smothered by the grapes on top, lack oxygen, and sometimes start the fermentation process anaerobically. These wines will not have all the characteristics of a wine that goes through full carbonic maceration, but you will get a hint of the process. To try wines that go through carbonic maceration, taste some of our Beaujolais selections or, try this Pinot Noir made using 100% carbonic!